No, not the Lloyd Cole classic . I'm talking about my Rift bags, like this one. Amazing! Still some room in there. My bags and I have been very happy together on our travels through Telara, or so I thought. Apparently Trion think there's room for our relationship to grow, however, and they're making some changes. To recap, Rift gives you five inventory slots, one of which is a fixed backpack and into four of which you can place any bag you happen to have. No I don't have any "spare change"
You can find bags as loot, get them as rewards for running errands or buy them from vendors. You can craft your own or buy them on the Auction House. They start at tiny, purse-size things that hold four items and currently cap out at 22-slot "epic" bags that no-one crafts because they cost more to make than you can sell them for. That sounds like a fair bit of space, but you'd be surprised. So before long it's off to the bank. Bankers aren't known for their generosity, so it shouldn't come as too much of a surprise that only that big vault at the top comes free. Those tempting slots along the bottom you have to pay for. And provide your own bags! I like flowers. Want to make something of it? Anyway, it's an elegant, if familiar system and I've been more than happy with it, so I was somewhat apprehensive when I read the recent patch notes for Rift's upcoming patch 1.4. * New items added to your bags (from looting, trading, etc.) are now highlighted in the bag UI the first time they are seen. Once you close the bag for the first time after obtaining a new item, the highlight is removed. 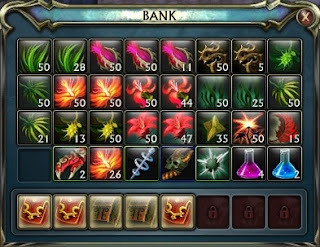 * Collected quest items that are placed in your bank now count toward the total required for the quest and will be withdrawn when the quest is turned in. 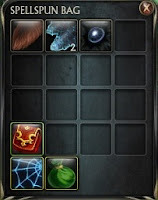 * All characters now have a 'quest bag' attached to their quest log which holds items that are either gained during or required for quests the character is currently on. There was more along the same lines. It made me think of Tobold's recent post where he made the point that you really need to be in at the start of an MMO to get the best from it. These changes are a case in point. The trend in MMO design for years has been towards automation. The longer the MMO has been around, the keener the devs are to do everything for you. Nothing is too much trouble. Sort your bags for you? Of course sir! Going to the dungeon this evening, madam? Just step this way, we'll have you there in a second, no need to get that lovely dress rumpled. Oddly, this is the kind of service I try my hardest to avoid in "real life". It's the valet parking, full service experience that seeks to protect you from actually doing anything for yourself. Only I prefer to do everything for myself. If you do it for me, you're having my fun. And if you do it better than I'd do it myself, that just makes it even worse! Yes, I know my bags are a complete mess and I can never find a dam' thing. Only last night,I went to pick up a quest item, found my bags were completely full and had to delete something in a hurry to make space. What did I choose to throw away? Another quest item for the same quest, of course, thereby bugging the whole quest, which I had to delete and retake and do over from the start. Was I mad, bro? No, I thought it was highly amusing and had a jolly good chuckle at my own expense. I'll remember that mistake for quite a while. It's the sort of experience I play these games to have. I like my bags being a mess. I like having to take a couple of hours out once or twice a week to tidy them. I like getting lost on the way to the dungeon and ending up in some ruin I really shouldn't have fallen down the cliff onto, three-quarters dead and running for my life with my robes flapping. That's kind of the point of being here in the first place. So, devs, I'll thank you to keep your hands out of my bags. Please.